I just wanted to do a blog to update all our members and readers about what is currently happening in regards to your wild horses. Since its inception in 2001, WHOAS has worked hard to both lobby the government to provide legislation affording the wild horses what we believe is adequate and proper protective legislation. We have also undertaken considerable initiatives to educate the public about the wild horses and the plight that have faced over the years. In my blogs I have tried to give all a little insight to what is currently happening with the wild horses and the behaviours which make them so unique. I am going to use this at this time to update everyone on our efforts to accomplish our objectives and to assure that our mission statement is carried through in everything we do. So let me tell you briefly about how we were formed and what has transpired over the years. In 2001 reacting to some atrocities that had occurred to some wild horses that were shot the previous year, a group of us got together and formed our society. Then through input from all we drafted together what we hoped would occur by forming our society in protecting the wild horses. Currently, the wild horses are managed under the Horse Capture Regulations which is governed under the Stray Animals Act of Alberta which were brought into effect in 1993. Despite government’s assurances, we have always felt that these regulations were inadequate to afford these beautiful animals proper protection. In the 1980’s there were larger herds of wild horses in our west country. It was during this time that the government authorized the removal of as many of these horses as possible. Trappers went about indiscriminately setting up traps and leg snares to remove the horses. Then what they could not catch, the government hired hunters to go out and kill more. In was in reaction to this that an early group, some of whom are still active members, pressured the government into adopting the current regulations. Since 2001, however, atrocities have continued to occur against the wild horses. Many have been shot and left to rot over the years. Then from November 1st to March 1st in a season, individuals buy permits to rope and trap them. Despite assurances over the years that only 20-30 horses were taken in any given season, we know this to be untrue. In a lot of cases some of these trappers continued to take many more than their permits allowed. It used to be that a ratio of 3 stallions to one mare was part of the regulations and also that the pens had to be inspected to meet standards as well as the horses inspected before removal. Then since WHOAS was formed, we have seen a slow erosion of these standards. This has been exemplified in the last 2 years where over 300 head of wild horses have been removed through trapping and any regulations involved in the welfare of these wild horses have been put aside. Thus we reach the point where we at now in our efforts to protect the wild horses. In previous years, we have had meetings with government officials which were very confrontational, but some small successes came about. Example, leg traps have been banned as well as the shooting of the wild horse has been incorporated by the government in their outlook. Subsequently I was contacted by a private company, Strategic Relations Inc., hired by the SRD to do an impact study concerning the wild horses and involving all stakeholders. This meeting was held in Olds with 2 of their representatives and myself and 2 other WHOAS members to provide our input on better strategies and better management principles to protect the wild horses. This was a very positive meeting and we came out of it with good expectations that finally something positive is being done to help us reach our goals in protecting the wild horses for future generations. Part of this will be the forming a steering committee involving all stakeholders. So one of the aspects we are currently looking at is taking these magnificent animals which are now considered feral and stray as they are now by the government, to be looked at as a distinct species. This is due to the fact that the horses are an integral part of the total ecosystem as it exists in our Alberta foothills today. 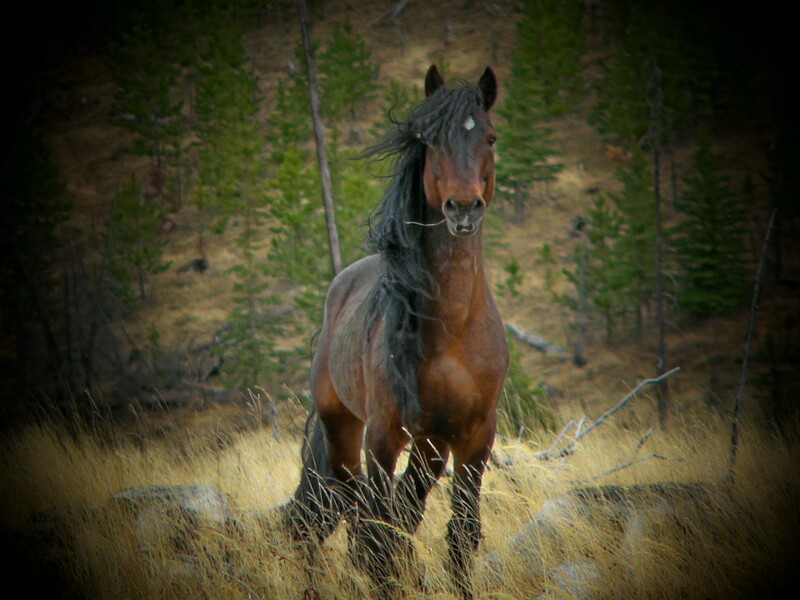 We’ve looked at other provinces for guidelines, e.g., Saskatchewan’s Bill 606 – to protect the wild horses of the Bronson Forest, Heritage Species Act of Newfoundland recognizing the Newfoundland pony for the part it has played in the history of that province, the Sable Island ponies of Nova Scotia, protected under federal regulations. One only has to look at other countries throughout the world like Germany, Namibia, Spain and England who are protecting small pockets of what they consider to be wild horses who deserve protection due the part that they played in the history of their countries. Historians note that as the white man made their way throughout North America and entered the Great Plains, they found the vast herds of buffalo whose numbers were only seconded by the number of wild horses that roamed there (they numbered in the millions). In 1874-75, when the NWMP entered what is now the province of Alberta, they too documented that there were thousands of wild horses roaming the prairies. Abandoning their fancy Eastern horses, who could not endure the hardships of the prairies, they took up capturing and using these stout, tough wild horses as their mounts. In was on them that they continued their journey west to peacefully settle our province. During WWI even, the military sent wranglers back into what is now the Red Deer River country and part of the current range of the wild horses to round up hundreds to be shipped overseas to pull the cavalry and supply wagons. Early pioneers being unable to afford as they called them, fancy horses, for generations as they settled our province, went into the hills to capture these horses and use them. So as you can see, the horse has played such a very important part in our lives and continues to do so today. The wild horses should represent to us this unbridled free spirit and be allowed to live free without being harassed. WHOAS knows that proper management is necessary and has our own strategies to properly manage the wild horses. We would like to invite you now to join our cause in affording the wild horses a proper designation as a heritage species and thus properly protected and managed. Our most important objective right now is to stop the trapping season for the 2012-2013 season. We feel that even going along with government numbers, would give insight into how the wild horses and Mother Nature may be able to manage their own numbers. Please contact your local MLA and the Environment Minister, Diana McQueen, to put a cessation on this year’s capture season. My Grandfather came to Canada from Norway in 1915. He settled into Sask. first then into Alta about 1920 Sundre area. He spoke about the wild horses that he seen at that time. I do not understand how anyone could say the horses are around because “people let them go” or they were just “let loose”. My Father talked about the horses he seen as a young man even in Sask/Alta area. These wild beauties have roamed different areas for as long as I know from hearing stories from my Grandfather.They do LESS distuction then man does. As said above in one note how the dirt bikes and quad riders do damage to different areas. The horses don’t do damage. The logging also damages,if not ruins the wild horses territory. I don’t understand why people along with the Gov’t don’t pull thier heads out of thier asses and realize these beautiful creatures are wild and should be left to live the way they have tried to live for over 100 yrs now. I just hope that sooner rather then later they learn to leave them be. To slaughter these horses sickens me. One day I do hope to be able to make a trip out to see theses beauties myself. Being born and raised on Vancouver Island,yet my “roots” come from the Prairies,some how I do hope that with the voices of those who believe these beauties are a part of our Canadian history.That they should be able to roam free,may the deaf ears of the Gov’t be opened. Just had to say this,I have spent the past week or so reading all you have tried to do for the wild horses and my hearts and prayers are with you.